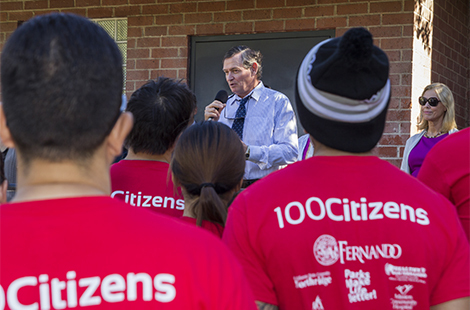 CSU Chancellor Timothy White visited CSUN’s award-winning 100 Citizens program on Sept. 22 during a daylong visit to the San Fernando Valley. Read more about the Chancellor's visit. Kana Brubaker-Gomez ’08 (Child Development), M.A. ’12 (Early Childhood Education), a preschool/pre-K teacher at La Petite Academy in Lancaster, was awarded the 2014 Preschool Teacher of the Year Award from LAUP. Read more about Brubaker-Gomez. Mayra Roxi Diaz was one of 23 students recently honored by the CSU Board of Trustees for her academic achievement, personal accomplishment and community service. Read more about Diaz. Fri., Oct. 3, 7 p.m.
Fri., Oct. 3, 8 p.m. Sun., Oct. 5, 7:30 p.m.
For Your Information this week features the Department of Police Services workshops, Sabbatical Leave notices and deadlines for the 2015 Faculty Retreat. The CSU Fee Waiver module is currently available for spring 2015 registration. To ensure timely processing, applications should be submitted no later than Oct. 24. Join Amy Rosenblatt of University Counseling Services for an informative and experiential series on understanding and incorporating “mindfulness” into your daily life. CSUN Professor Talks About the Mothers of East L.A.